St Mary's in Norfolk is a Grade 1 listed medieval church situated within the Reepham Conservation Area. It was refurbished in 2016 using money from The Heritage Lottery Fund and the local community. 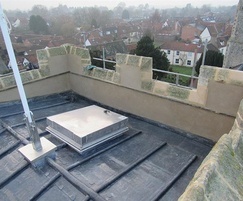 The work included repairs to the church tower and roof. The project was a challenge in both a physical and historical context. A means of safe access was required to the roof area, which meant finding a solution that was technically and architecturally suitable. Bilco UK is experienced in working with specialist conservation contractors and architects on ecclesiastical architectural projects, from medieval churches to Scottish castles. 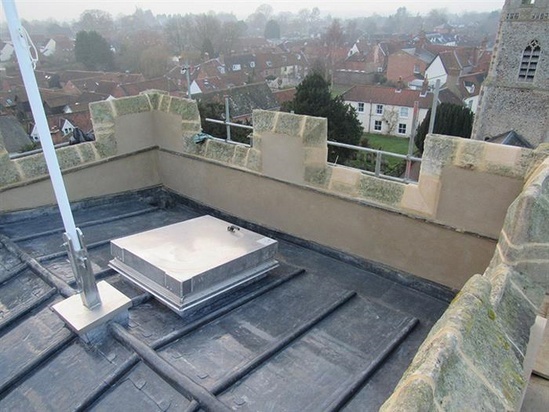 For this project, the company's S-50VMTB VersaMount® replacement roof hatch was specified by the project architect and installed by the specialist contractor, Medieval Masonry Ltd. The S-50VMTB VersaMount® was suitable since it could be installed as a replacement into the existing curb without the need for re-roofing. The low profile VersaMount® curb features a built-in flange and apron, and an innovative anchor clip system to ensure a fast, secure and weathertight installation. Idea for listed buildings and other heritage assets.